You love the look of a well-manicured lawn, but don’t want to break the bank. There are a few simple things you can do to ensure you get the best lawn care service pricing. Most people have at least one positive lawn care service experience. Your friends and family can be a valuable resource to find a lawn care service. If a lawn care professional has a good reputation and gets repeatedly new customers by referrals, they do not have to spend as much on marketing. Often these companies will pass those savings onto the customer. The Internet is a great resource to finding lawn care service in your area. It is important to remember to take some reviews with a grain of salt. People are much more likely to write a bad review, than a good one. But if you see a pattern of multiple bad reviews, then it may raise some red flags. While looking for the best price, it is important to realize that there are a few variables that go into lawn care service pricing. This will include the size of your yard, and the amount of maintenance certain plants may need. You also don’t want to sacrifice quality in the name of frugality. Try to consider the quality of the landscape work in your calculation of what you are willing to pay monthly. 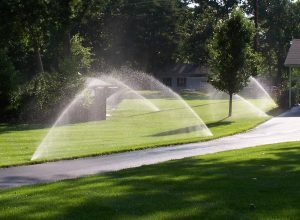 Compile a list of some lawn care service providers that caught your eye and inquire about pricing. They may want to come out and look at your yard to give you a better quote if your lawn is more complicated. Compare prices and pick the service provider that you think would provide quality service at an affordable rate. We would love to speak with you regarding your lawn care. Contact Blooms Landcare at (817) 688-5352 for a consultation and estimate today.